A BORN again sausage company producing more than 200 sausages a minute is looking to double turnover in the next year. 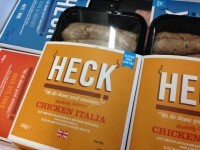 Heck Food was opened last year at Leeming Business Park near Bedale, by husband and wife team Debbie and Andrew Keeble and their four children Jamie, Roddy, Ellie and Guy. The couple had previously established the award winning Debbie & Andrew’s sausage company which they sold to J and J Tranfield in 2005. But after the company decided to transfer production out of Yorkshire the couple, who live at Kirklington, near Bedale, decided to part with the brand and set up their own new firm. They’re now producing more than 500,000 sausages a week, employing 21 people as well as the family, and have recently agreed a funding deal with Barclays for the major expansion.